Lush and bold, Swiss Cheese Plant makes a good accent if you have the space. Over several years it can grow several feet tall and its dramatic, perforated leaves to 12 inches (30 cm) long or more, so it needs a bit of elbow room. Keep those leaves dust-free and shiny by gently wiping them with a damp cloth. This handsome foliage plant is a climber in the wild, scrambling up large trees, anchoring itself with thick aerial roots which also take in moisture and nutrients. You can tuck aerial roots that emerge near its base into the soil and train others to climb a moss pole. Young plants have smooth leaves. But as it matures, the leaves develop deeply cut edges and wide slits. 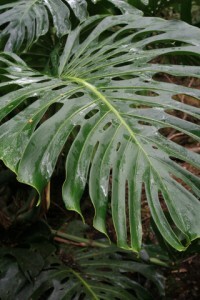 In its native jungle habitat, the slashes, holes and cuts in the large leaves help the plant to withstand strong winds and torrential downpours. Most problems with Monstera will show in its leaves. Yellowing lower leaves are a symptom of overwatering. Water thoroughly, then allow soil to dry out a bit before watering again. Curled, crispy leaf tips could indicate low humidity or too much fertilizer. Flush soil with clean water to wash away any accumulated fertilizer. Wait a month before feeding again. If they are not getting enough light, large leaves grow without holes and slits. Give the plant moderate to bright light, but not direct sun. Scorched leaves (dry, brown spots) are caused by strong, direct sunlight. Deliciosa means pleasing, referring to the white spadix flower (shown at right) that develops into edible berries on mature plants grown in tropical Central America. 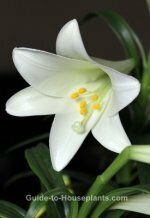 However, Swiss Cheese Plant rarely produces flower and fruit when grown indoors. This big-leafed plant is sometimes called Split-Leaf Philodendron, but that's a different genus. 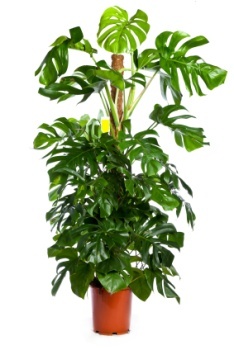 Look for Monstera deliciosa to be sure you're getting this plant. CAUTION: The leaves of Swiss Cheese Plant are poisonous and can cause severe burning in the mouth if eaten. They can also cause skin irritation, so I'd recommend wearing gloves when handling this plant. Repot in spring when roots have filled the pot. Use a pot with drainage holes to prevent soggy soil. Height: Up to 10 ft (3 m) tall. Light: Bright light, no direct sun. If leaves on mature plants grow without holes or slits, give the plant more light. Water: Water thoroughly and allow the top inch of soil to dry out between waterings. Keep soil barely moist in winter. Yellowing lower leaves are usually a sign of overwatering. Provide good drainage. Humidity: Average to high (at least 40% relative humidity). See these tips for raising the humidity indoors. Soil: Mix 1 part peat moss-based mix and 1 part sand or perlite for good drainage. Fertilizer: Feed every 2 weeks spring through fall with a balanced liquid fertilizer diluted by half. Feed monthly in winter.